I thought I’d write a bit about the region of southern France in which we have spent so much time these past 14 years – not enough time, never enough. We’ve recently returned from our home there and through the medium of food I shall attempt to share a sense of the place we so love, through a series of posts. We are very much in the middle of the Pyrenees, in the sense of being a more or less equal distance from the Atlantic to the Mediterranean, for this reason the local fare is traditionally that which you would associate with a landlocked , mountainous place. 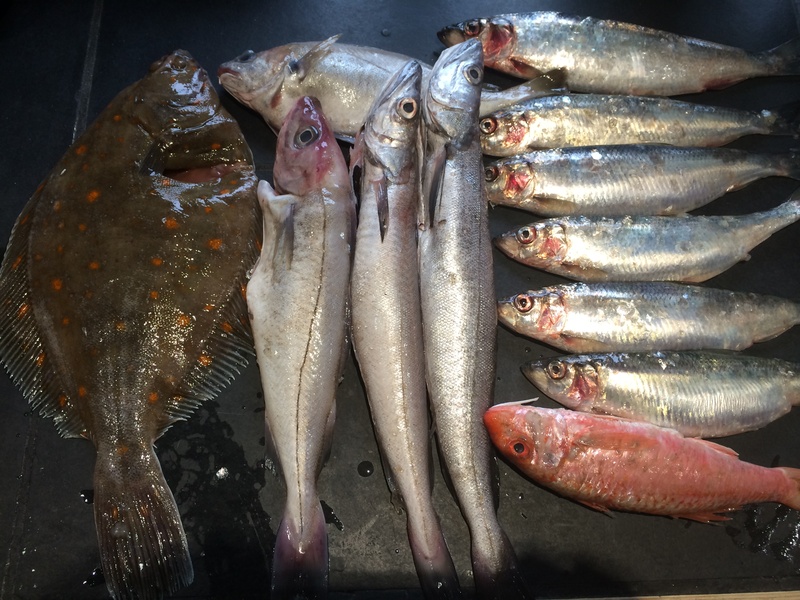 However, as the Pyrenees are almost a region of themselves, book ended by two very different but amazing bodies of water, and spanning historical regions and countries as well as two very distinct nations, we have access to the most outstanding produce and of course, seafood too. Mountains and seas, valleys, pastures and plateaus make up the landscape. Over the next few posts, I’ll try to capture those things that make up the essence of this ‘country’. 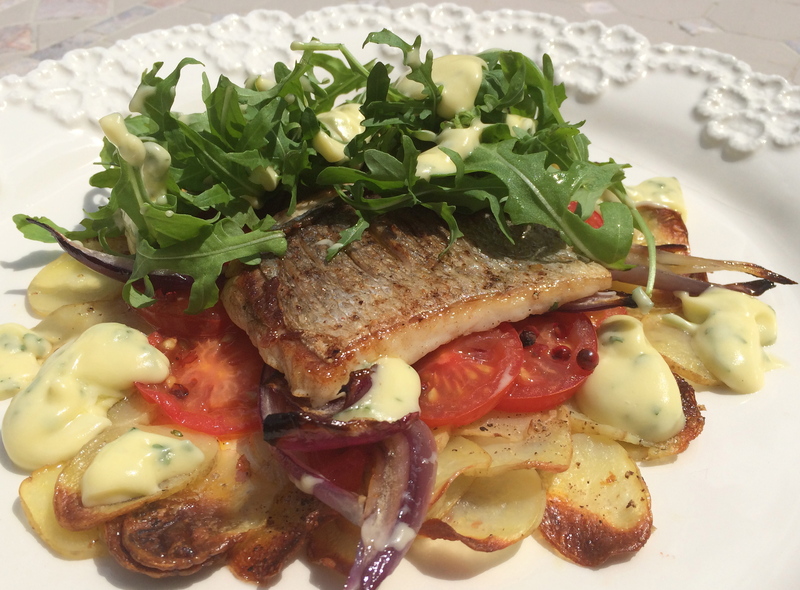 Sea bream, from the Med, has been a feature of many happy meals for us, when we first accessed the ready supply of bream all those years ago on our arrival down south, we had yet to see such a fish in London supermarkets. It’s been a love thang, so when we stumbled into our local supermarket, to find these stiff fresh, glossy beauties we had to have them for our supper…day one. The French, in m y humble experience, expect – no demand – high quality produce. If not supplied, those in our region would simply resort to harvesting from their own enviable vegetable plots. Our village is of the valleys facing the mountains, of pastures punctuated by streams, creamy white cows, hardy sheep and the meadow flowers of Spring. Going into our slightly revamped local shops in April would not usually have yielded the array of tomatoes we found there, this would be reserved for high summer but the offer would nevertheless have been good all year round. On this occasion it was so fabulous that we ended up making a dish usually reserved for those late August days when a glut of gorgeous red fruits causes constant thought on what next we should do with them. We treated the fish simply, stuffing it’s belly with some celery leaves and a few lemon slices. Well seasoned, with a sprinkling of olive oil we baked them in hot oven for 20 minutes or so, until the flesh just turned opaque and moved gently way from the bone when pressured. There is a milkiness to the fl esh, clean and soft. For the peperonta, we charred some peppers over the gas flame before wrapping them in cling film to help with the removal of their filmy skins….the April afternoon heat reflected into the kithen while we toiled and across the field, the church bell tolled the passing hours. I skinned tomatoes, not obligatory, but for me a preference to chasing the skins around the pan. We roughly chopped all, and soften onions in olive oil with a little garlic. Once translucent, we added a couple of ‘rinsed anchovies’ that had been preserved in salt…a rememberance of days inhaling salty air in the home of anchovies…St Jean de Luz over on thr Atlantic side. Tradition may demand different ingredients, we put in just what we had, the labour of cooking providing a welcome interlude to our list of other duties. Adding the tomatoes and peppers, then some sea salt and coarsely ground black pepper…. shadows lengthened in the courtyard. The crystal air of the day before had given way to a slight heat haze, offering the distant, still snow capped mountains an ethereal glow. The ruby ingredients bubbled away for a while and then we extinguished the heat, once the fish was almost cooked we would gently warm them through. After the golden glow of early evening reliniquished to dusk, we would eat well. What I’m missing by being a veggie! Great blog – when can we expect the book? Would love to do the book…don;t hold your breath though, it’s all I can do to get my blog done!